Where crawler or all-terrain cranes can reach hundreds of feet into the air, hydraulic gantries are designed for lifting where 100’s of feet aren’t available overhead. Originally used in the press installation industry because of their impressive lifting capacities in areas with reduced headroom, hydraulic gantries are now used over a variety of industries. 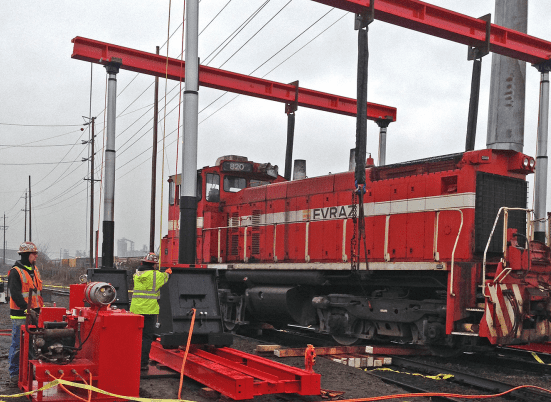 The perfect solution in railyards or when traditional cranes can’t be used, hydraulic gantries offer a safe and efficient alternative for lifting. The Lift Systems 44A gantry can handle up to 400 tons of weight and has a max height of 27 feet. More than 100 feet of runway track is included. The Lift Systems 44A is a safe, efficient way to move heavy loads over short distances. While a gantry may not have the range of movement of a traditional crane, it’s compact nature does allow for faster lifts, especially if the job requires similar movements for each lift. With radio remote control, digital height indicators, leveling systems, and other features, the Lift Systems 44A hydraulic gantry will make quick work at rail yards or wherever else overhead space is tight. For more information about the 44A, or any of our other lift systems, contact NessCampbell today.